Whether you’re an experienced snorkeler or trying it for the first time, snorkeling is a "don’t miss" on your visit to St. Thomas. When it comes to aquatic encounters, every Caribbean destination has something unique to offer, and the snorkeling in St. Thomas, Virgin Islands is no exception. To get the most out of snorkeling in St. Thomas, you’ll want to plan ahead to ensure you’re geared up and in the know on the best St. Thomas snorkeling spots and best times to hit the seas. 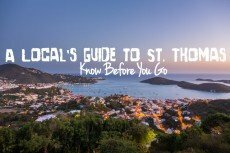 How to Go Snorkeling in St. Thomas- The first item on your list for snorkeling is always gear: mask, snorkel, and optional fins and life vest. If you have your own, your only decision when it comes to gear is whether or not you have the space to pack it. If you decide to save the space or don’t have gear of your own, you can rent snorkeling equipment in St. Thomas. Having access to gear will open up the whole island as your snorkeling emporium. Be careful to check your itinerary before renting gear as many St. Thomas snorkeling excursions will include all the gear you need such as ecotours with snorkeling as well as most sailing and boating excursions. Keeping that in mind, you may not need to rent. Where to Go Snorkeling in St. Thomas- Once you’ve got a plan for gear, where you should go snorkeling on St. Thomas is the next item on your agenda. 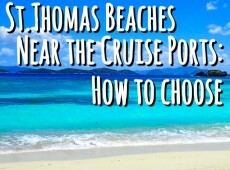 If you’ve got your own gear, a Sightseeing and Beach Tour in St. Thomas or Private Beach Hopping Tour will get you to the top St. Thomas snorkeling beaches. Based on snorkeling, my recommendations are Secret Harbor, Sapphire Beach, and Coki Beach. St. Thomas sailing and boating excursions open up a world of possibilities for snorkeling spots. Experience reef off the coasts on a St. Thomas Half-Day Sail, explore the waters of St. John on a St. John Full Day Sail, or sample the best of both on a U.S. Virgin Islands Private All-Inclusive Full Day Sail. Passport-carrying travelers can snorkel the BVI waters on a Jost Van Dyke Full Day Sail and try exotic snorkeling locations such a the Baths at Virgin Gorda on a St. Thomas Charter Boat Tour. For more remote snorkeling spots, ecotours will take you through the St. Thomas Mangrove Lagoon. When it comes to snorkeling in St. Thomas, the Virgin Islands has so much to offer. I highly recommend trying different locations, as many as your itinerary will allow, as each area offers something unique to encounter. When to Go Snorkeling in St. Thomas- When you should go snorkeling on your St. Thomas visit encompasses many things: time of year, time of day, and duration of snorkel. The “coldest” time of year for St. Thomas waters are November-March. While the water is still warm by most standards, consider a rashguard if you’re sensitive to cold. The Caribbean is warm bath water in the months in between, so you will likely not need any additional layers. However rashguards offer protection from the sun if you’re planning on snorkeling during midday/early afternoon or for an extended period of time. Did you know different marine life can be seen at different times of the day? Though you never know when something unique will show itself, early morning and evening are best for in-shore snorkeling in St. Thomas as the sealife is usually more active which should be considered if you’re planning to go out from the beach. Off-shore snorkeling is more unpredictable as there’s less human interference and open waters surrounding the reef. Sailing, boating, or even kayaking off the coast of St. Thomas or St. John will deliver excellent snorkeling any time of day. The duration is for you to decide. A Beach Hopping Tour will leave the snorkeling itinerary up to you. Sail and Snorkels are available as half-day or full day excursions, and St. Thomas Boat Rentals are private and fully customizable. 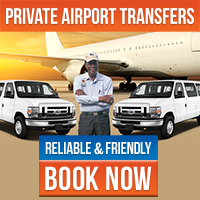 Ecotours are also available as three and five hour trips. Keep in mind the season and time of day you’ll be snorkeling as you pack, and consider the length of your excursions as you plan your itinerary. Sea turtles, stingrays, or schools of colorful fish, there’s always something to encounter in the Caribbean Sea. If you’re visiting St. Thomas from a cruise ship or taking an extended vacation, be sure to pencil in a snorkeling stop on your itinerary. 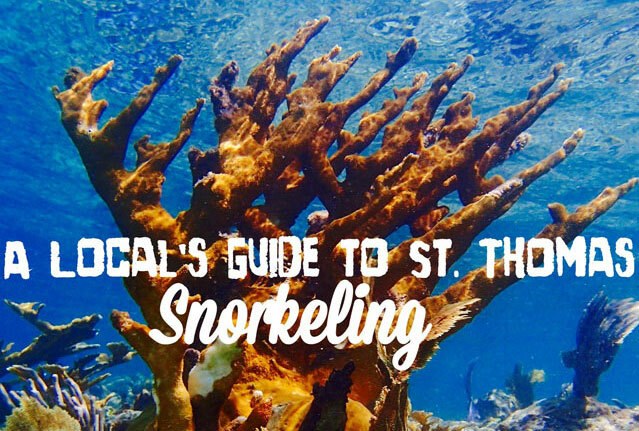 Use these tips to get the most out of your St. Thomas snorkeling experience. Be sure to visit our Snorkeling page for the best St. Thomas snorkeling tours and excursions! If you have any questions about snorkeling in St. Thomas or any inquiries about the island, call or e-mail us for authentic local insight! 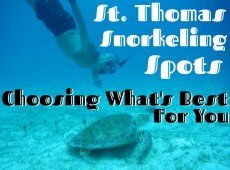 Looking for snorkeling options in St. Thomas? Look no further. From best spots to excursions, we've got everything you need to know about it.